Dr. Austin received his PhD in Medical Sciences from McMaster University. He also trained as a Postdoctoral Fellow in the Department of Human Genetics, Hospital for Sick Children in Toronto. Dr. Austin is currently a Professor of Medicine in the Division of Nephrology, McMaster University and St. Joseph’s Healthcare Hamilton. 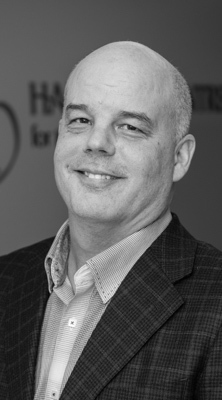 He is also a Career Investigator of the Heart and Stroke Foundation of Ontario (HSFO) and holds the Amgen Canada Research Chair in Nephrology. Dr. Austin and his research group have published over 60 peer-reviewed papers, book chapters and review articles. The overall goal of Dr. Austin’s research program is to better understand the underlying cellular stress pathways involved in the development and progression of cardiovascular disease and kidney disease. Some of the major discoveries in Dr. Austin’s laboratory include (i) defining the role of endoplasmic reticulum (ER) stress in atherosclerotic lesion development and vascular calcification, (ii) demonstrating a causal role of TDAG51 in atherosclerosis and obesity, and (iii) identifying the cellular factors that contribute to blood flow and fibrosis in the kidney. Furthermore, Dr. Austin and colleagues have shown that inhibiting the pathological effects of ER stress can suppress many of the downstream pathways that contribute to atherosclerosis, obesity and renal disease. Novel strategies to inhibit the ER stress response pathways are now being investigated as a potential therapy to prevent or delay the onset of these diseases. Established mouse models of atherosclerosis, obesity and renal disease are being utilized to better assess these novel strategies aimed at preventing and/or treating cardiovascular/renal disease and their complications. Peer-reviewed personnel funding from the HSFO and grant-in-aid funding from the HSFO and CIHR total >$600K per year. Dr. Austin is also the Director of a HSFO Program Grant that brings in an additional $250K per year. Total amount of grant-in-aid funding during the past 3 years is $1.9 million. In addition, many of the graduate students and post-doctoral fellows in Dr. Austin’s laboratory are funded by trainee awards from CIHR and/or HSFO.